You know how I feel about my freezer. I love all that good stuff in there that I made in double batches a while back so I could grab it on a busy night. Here’s a way to give new life to that Winter Vegetarian Chili you stashed away (and stretch the frozen quart to feed a whole family). Of course, a baked potato makes a mighty fine meal even if you don’t have chili handy (although that chili really is worth making). And if you’re in a part of the world where the weather now makes eating chili & baked potatoes seem SO last season…well, feel free to gloat in the comments. Baked Potatoes with Chili: Bake as many Russet potatoes as you like. Scrub them well, poke some holes in them with a fork, place them on a cookie sheet or right on the oven rack and bake at 400 degrees for 45-75 minutes, depending on size. (You could also lightly rub the skins with olive oil and salt, but I don’t.) The potatoes are done when you poke them with a fork and the interior feel soft under the crispy skin. Split potatoes open, spoon in a big scoop of warm chili, and top with salsa, shredded cheese, and thinly sliced green onions. This entry was posted in Beans and Other Legumes, Mexican Flavors, Vegan or Would-Be-Just-As-Good-Vegan and tagged beans, cooking, DIY, family, food, homemade, kids, lifestyle, recipes, vegetarian on April 2, 2012 by emmycooks. omg! someone else does this?! I thought our family was strange for doing it, but it’s one of our favorite go-to meals in the winter. We stick some russets in the slow-cooker all day, make a pot of chili and have at it at night. Love the idea of freezing chili (we usually never have any left to do it!) and pulling it out for this meal. Really? You bake potatoes in your slow cooker? Tell me more! THIS is the whole reason to have a food blog, as far as I’m concerned. I would never have thought of that but it would make baked potatoes so easy! Do you have to put some kind of liquid in the bottom to keep them from burning or sticking? And soak up some sunshine for me, will you? Chili in the freezer–absolutely! It has saved us on all kinds of occasions. I’ve definitely served it up over potatoes, although mine are generally mashed instead of baked. Either way, it’s a great plan! Your comment was the first i had ever heard of topping mashed potatoes with chili, but the quinoa chili recipe I made this week suggests serving it over a potato and turnip mash! A combination my two of my favorite foods? I am definitely going to have to try it. Thank you! I love baked potatoes. And I love my homemade chili, though I am the only one in the house who does, so I have to freeze it when I make it. The way I really love chili is with a little grated cheese on top and homemade bread to break up in it instead of crackers. Yum! My favorite weekday lunch! 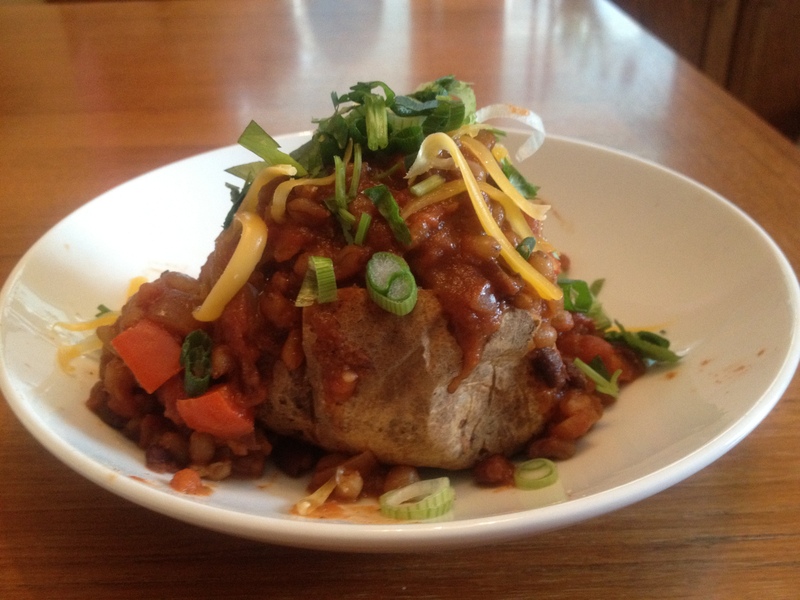 I agree, baked potatoes are great with veggie chili!